I’m excited to share my latest listing, an adorable home in a fabulous Ravenna location! Close to the University of Washington, Children’s Hospital, Green Lake, future Roosevelt transit station, bus lines, Whole Foods, Magnuson Park, Third Place Books, and restaurants galore. And according to Seattle Schools, it’s in the area for the coveted Bryant Elementary, Eckstein Middle, and Roosevelt High Schools. This home offers a large kitchen space, one bedroom and a den, large back deck, and fabulous landscaping. The den used to be a bedroom you could potentially reconfigure it to create a second bedroom. Very private, up off the street. It also has a one-car detached garage. It’s a great condo alternative or the opportunity to create your dream home with your updates and/or build an addition. The home had a new roof installed and the chimney was rebuilt in 2017. Attend an open house Saturday, August 25, 1:00-4:00pm, Sunday, August 26, 11:00am-1:00pm, or Monday, August 27, Noon-2:00pm. Call Jamie at 206-790-0081 or send an email. Just one block from Green Lake and three from the restaurants and shops of Phinney Ridge, this home offers all that you’re looking for. Offers will be reviewed upon receipt and the sellers have already conducted a home inspection. Or call for a private showing. For more information, download a flyer or check it out here. 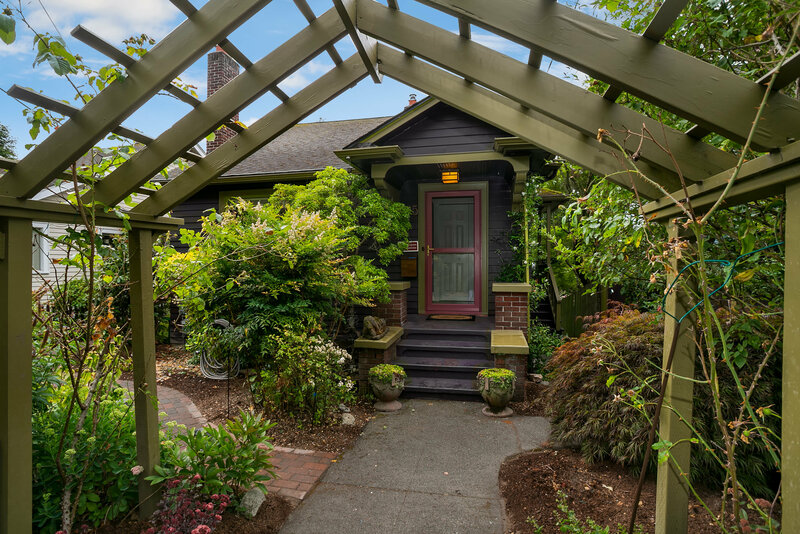 I’m excited to announce my latest listing, a wonderful 1911 bungalow in Seattle’s Wallingford neighborhood. This home has 3 bedrooms and 2 full baths and is waiting for your updates. Additionally, the house has cathedral ceilings, loads of natural light, and period touches. Add to that a sun room off the kitchen – imagine sipping your coffee while watching the sunrise over the Cascades, or put in a comfy chair and you’ve got a reading nook. Gardeners will love the yard with its raised beds, fruit tree, and flora. Right now there are crab apples, tomatoes, and zucchini coming in. There’s a one car detached garage, rebuilt in 2001. The location is ideal – just blocks to Gas Works park & local shops. Easy access to the University of Washington, South Lake Union, and downtown Seattle. Check out my latest listing on Phinney Ridge/Green Lake. Live at the confluence of Phinney & Green Lake, waking to the brilliant sunrise over the lake. This elegant home, rebuilt in 2004, offers updated features throughout, including a guest suite/MIL/nanny quarters/rec room on the lower level with separate, level access. You’ll find 3 bedrooms and 2 full baths upstairs. Enjoy views of Green Lake, the Cascades, and Mt. Rainier. With the restaurants and shops of Phinney Ridge just blocks away and Green Lake across the street, everything you desire is close-by. Easy access to downtown, University of Washington, and South Lake Union. On Wednesday I told you it was coming – so here it is. I’ve brought on a listing in Seattle’s hottest neighborhood Phinney Ridge. One and half blocks to Green Lake for outdoor activities, two blocks to the P-Patch, a half mile to the Zoo, and just 3 blocks to the all the retail and restaurants of Phinney Ridge – Red Mill Burgers, Starbucks, Ken’s Market, Greenwood Hardware, Umpqua Bank, and so many more local small businesses. Plus you’re just blocks from the Phinney Neighborhood Association which hosts the Farmer’s Market, numerous community building events, classes, a pre-school, and much more. This home, at 736 N. 70th St., offers 3 bedrooms on the upper floor, 1.75 bathrooms, an additional room on the main that could be a 4th bedroom, family room, or home office. Southern exposure brings you lots of natural light, with a peek-a-boo view of Mt. Rainier from upstairs. A level, grassy, fully fenced backyard is perfect for your pooch to run around in, as well as for summer barbecues, croquet, and all-around fun. On the lower level you even have a working sauna in which to unwind at the end of the day. Check out the home online, download the home flyer, or give me a call at 206-790-0081 or an email for more information or a private showing. List price: $549,000 and offers will be reviewed on June 13, 2014.